Brother and sister Enrique and Rosa flee persecution at home in Guatemala and journey north, through Mexico and on to the United States, with the dream of starting a new life. 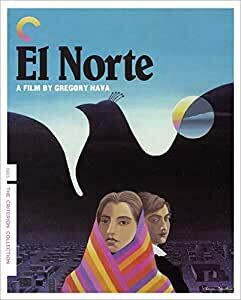 It s a story that happens every day, but until Gregory Nava's groundbreaking El Norte (The North), the personal travails of immigrants crossing the border to America had never been shown in the movies with such urgent humanism. A work of social realism imbued with dreamlike imagery, El Norte is a lovingly rendered, heartbreaking story of hope and survival, which critic Roger Ebert called a Grapes of Wrath for our time. One of my 3 favorite movies. Slow moving the first 10-15 minutes, primarily because it's in Mayan, but then switches to mostly Spanish and English. This is a very intense and engaging movie about the genocide of Mayan indigenous people during the early 80s which was authored and supported by the U.S. It shows the human consequences of vicious, greedy foreign policy and, most importantly, humanizes immigrants. A friend of mine got into an argument with her wealthy, conservative parents regarding immigrants and why they come to this country. I met a very young couple from Guatemala whose circumstances were far worse than that of the sister and brother protagonists in the film. We see the horrifying conditions that are deliberately created by U.S. proxy puppet governments. It's very colorful, has a beautiful soundtrack, and an excellent plot which is an understatement about events in Central America. A true depiction of the reality there could never be made. Although El Norte is very sad, it's no where near the reality of the suffering of the Central Americans who are trying to immigrate to the U.S. "Our" nation created the appalling conditions that are driving thousands of Guatemalans and Salvadorans to these borders for sheer survival. Since the Eighties, when I first discovered this masterpiece, this gorgeous film has informed my soul and my feelings of the tragic collective loss that we all share and feel and that the multinational Capitalist corporate machine, with our complicity, has created. USians think that the "Indian Wars" ended with Custer but it continues today...in the Amazon, in South America, in Palestine, in the Canadian First Nations tribes, and at Standing Rock, North Dakota. Reminiscent of a Shakespearean tragedy, this moving, mystical, and artistic film always causes me to weep. It's a story of the Garden of Eden, of beautiful, trusting indigenous people, who, having lived in the garden in peace and harmony for millennia, are invaded, exploited, victimized, crushed, and in order to survive, forced to flee as refugees to a mythical "Promised Land", a land that turns out to be corrupt, alien, and heartless. As Enrique laments, "Yes Rosa...you can make a lot of money here but ...you pay so much...for everything." This is a must-see for those who really want to understand and empathize with the "refugee crisis," and to understand that we will all be refugees soon. A bit dated in its depiction of the two main protagonists, but still very moving story of the fraught journey of a young brother and sister forced to leave Guatemala during the civil war years there in the early '80s. Enrique and Rosa, residents of a traditional Mayan village in the highlands of Guatemala, leave their pueblo in the aftermath of the deaths of several men, including their father, who had begun to develop plans to gain title to the land they had worked for centuries for rich landowners. The story is leavened by humor, such as Enrique's being tutored, to be mistook for a Mexican, to liberally sprinkle his Spanish with the "f" word. The two are depicted as being, to this viewer, as perhaps a bit less street savvy than people of their background would be. Their being shown as being so innocent makes the story much more gripping. The humor continues in showing them on their jobs in the US. Rosa and her co-worker are so befuddled by the workings of their employers washing machine, that Rosa washes all their clothes by hand. Enrique gets a job in a fancy restaurant, with the obvious marked contrast between the world he came from and the milieu of the well dressed immaculately groomed patrons of the restaurant. As expected in such a story, all good things must come to an end. Enrique is turned in to La Migra, and Rosa succumbs to an illness she had acquired while crawling through a sewage tunnel during their trip between Tijuana and the US. I recently bought the Criterion Collection edition of El Norte, not having seen the film since it's original release in the early '80s. As I mentioned, the story is a bit dated, but overall, the truths it depicts haven't drastically changed. People will always seek to better their lives,and, to do so, as with the displaced children from Central America featured in current news stories, will continue to pursue the dream of El Norte. This film shows what some people have to do to escape genocide in their home country and hardships they go through upon arriving in the United States. It affirms courage in present danger and shows how the bond between a brother an sister can't be broken even in the face of true tragedy. Have tissues ready, and watch with an open mind. This is a very powerful movie. For me, this was on a par with other movies that stay in your mind, like "The Killing Fields." I am also kind of enamored with Latino culture, but mostly Mexican, not Guatemalan. This is compellingly filmed, especially in the beginning to about halfway through, and again at the end. This movie was made in the '80s, when Guatemala was in turmoil (some think because of us), and graphically shows the result of the death squad activity. Not for the faint of heart, but definitely worth watching.